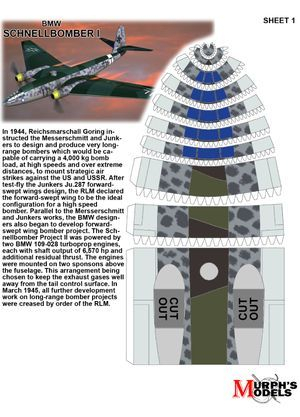 This BMW-designed Schnellbomber (fast bomber) was a compromise between speed and range. 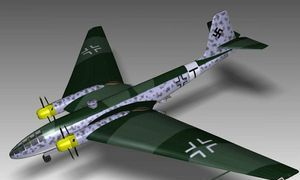 Power was supplied from two BMW 018 jet engines (3450 kp thrust) mounted beneath the wing trailing edge, and from two BMW 028 turboprop engines (3100 horsepower) located above the wing leading edge. It was intended for all engines to be used on takeoff and when bursts of speed were needed, otherwise cruising would be done only with the BMW 028 turboprops. 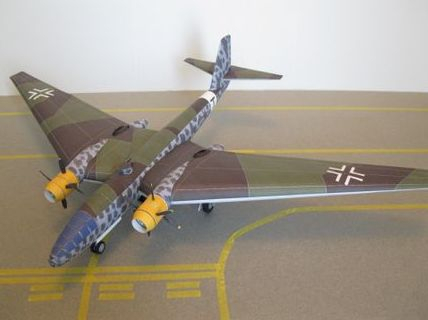 The mid-fuselage mounted wing featured a small section of forward-sweep, with the outer wing panels being swept back. An interesting feature was the landing gear, which consisted of three tandem wheels under the fuselage. One set of wheels was located beneath the cockpit and the other two were set close together near mid-fuselage. Also, there was one landing gear to the outboard side of each engine nacelle. The three man crew sat in a pressurized cockpit in the extreme nose of the aircraft. Defensive armament was to consist of two remote-control turrets (with two cannon each), one on top and one on bottom, aimed by a periscope from the cockpit. A bombload of 15000 kg (33000 lbs) could be carried.